There were separate parking areas for visitors, VIP's, disabled people and permit holders all strictly and efficiently controlled. 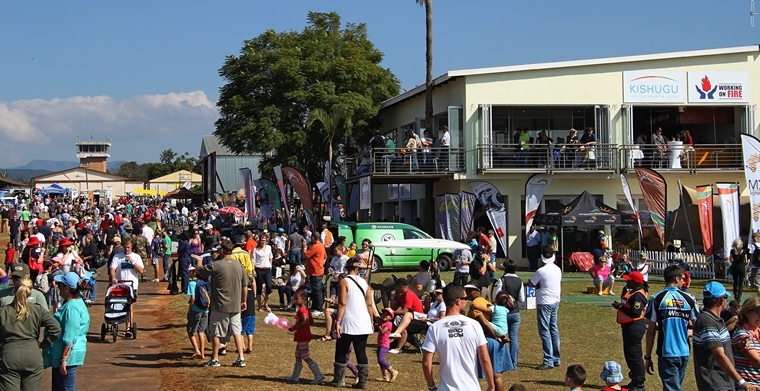 The general layout of all facilities were superb and the field Pilots, participants, VIP's and the media were all treated like royalty with a scrumptious finger lunch on the Friday and a braai the evening. Lunch was again available on Saturday followed by a sit down dinner after the show. 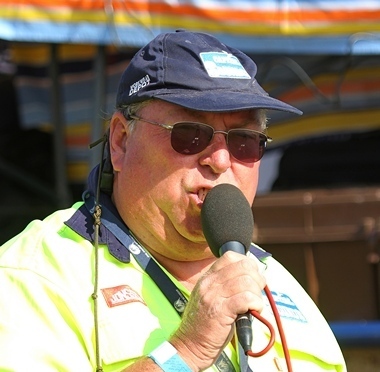 Brian Emmenis and his team of sound experts were in attendance and they showed that when it comes to commentating at airshows there is nobody that does it better. Their equipment is of world class standard, the commentary informative, exciting and entertaining and their use of guest expert commentators brings a unique flavour to an event. 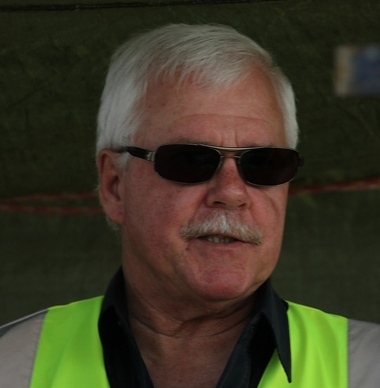 Brian's knowledge of participants is encyclopaedic and he is assisted by Leon du Plessis who ensure that the technical details of participating aircraft are up to date. 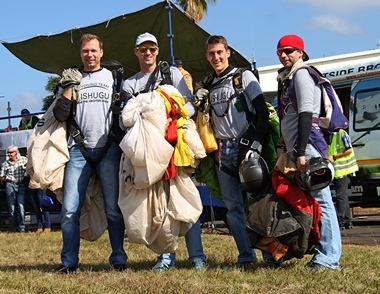 Manning the tower amongst others were Johan Heine, CEO of Kishugu and Event Director as well as event air boss Charlie Marais and air boss Koos Kieck. 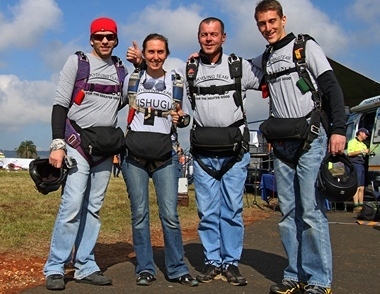 A team of Skydivers of Adventures Skydive opened the show. 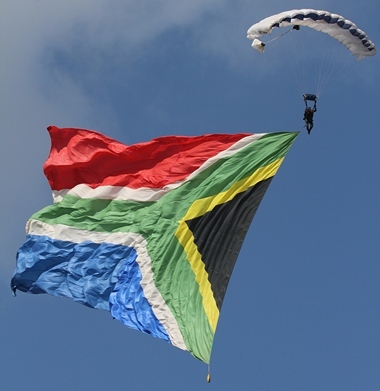 A different type of Skydiving was next when Lomac, the Lowveld Model Aircraft Club dropped two radio controlled skydivers from one of their stunning scale model radio controlled aircraft. They also displayed a jet powered Thyphoon and Yak 54. 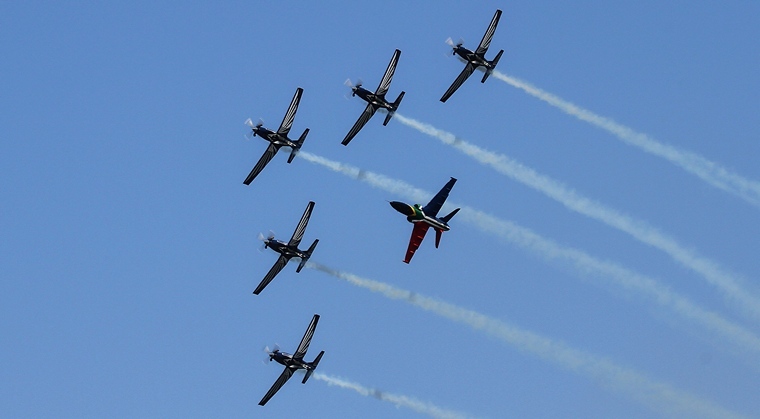 The first local act and one never seen before at a airshow was a display of two Foxbats led by Etienne Oosthuizen. 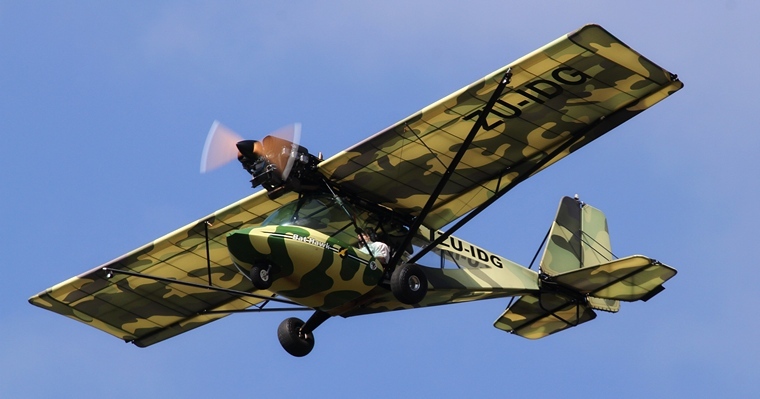 Ex SAAF pilot, Johan Joubert and a legend in his own lifetime then took the sky to display the iconic Allo III. 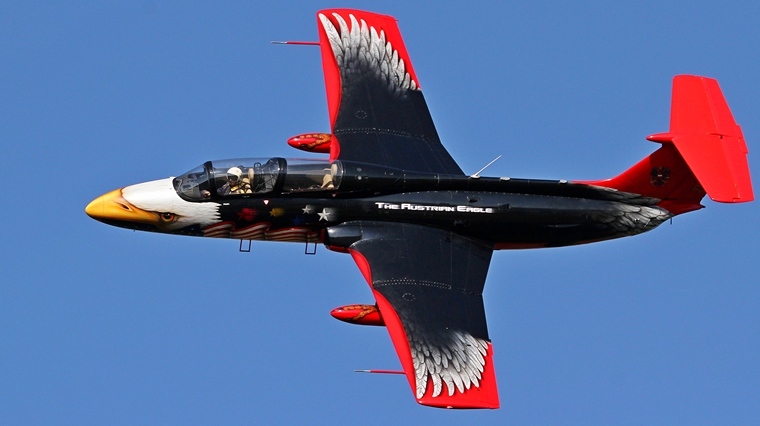 Next was another local Andrew Pappas owner of Micro Aviation manufacturers of the Bat Hawk series of aircraft, the country's best selling LSA type. The Bat Hawk is used extensively in Africa in the game conservation role. 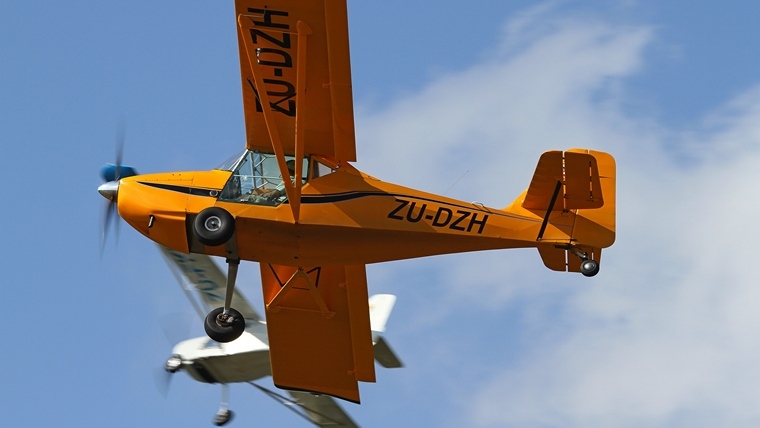 Nelspruit featured a large number of locals and the three ship Fox Bat display led by Simon Bennet showed that a formo display in a LSA type can be just as exciting as in purpose built display aircraft. Team Kittyhawk in their Vans RV's led by Pierre Gouws proofed that the kit built is an excellent basic aerobatic aircraft. 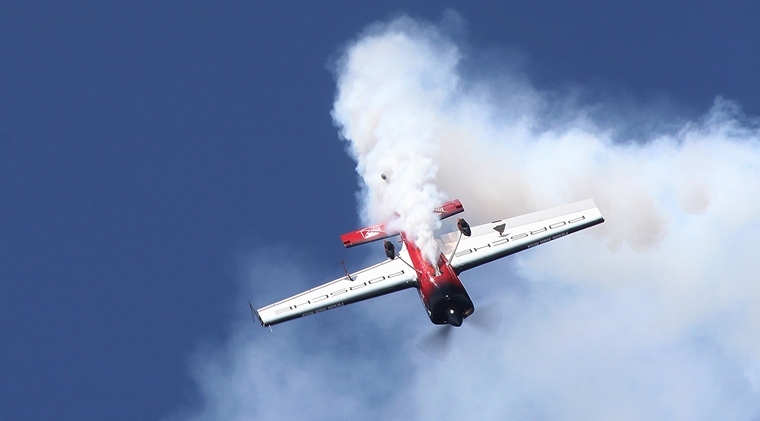 Crowd favourite and ex world open aerobatic champion Nigel Hopkins had the spectators on their feet with a display that defies the law of gravity. 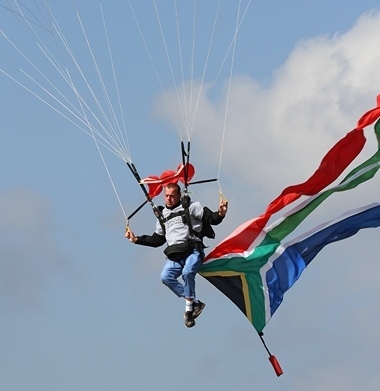 Danie Terblanche another local, ex SAAF pilot and a regular airshow performer took to the sky in the Westland Gazelle in a display that explored the full flight envelope the French helicopter. 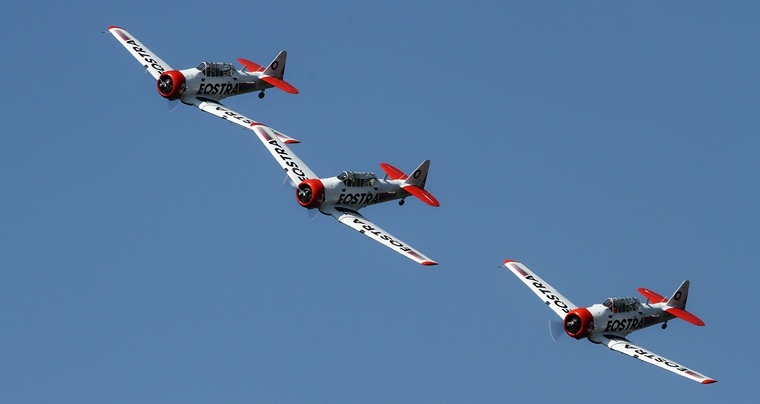 The first of the usual performers were the Eqstra Flying Lions Harvards. Scully and his team of legendary aviators also closed the show with a breath taking dusk display. Riaan Prinsloo a resident of Middelburg and regular competitor in aerobatic competitions as well as a part time spotter plane pilot brought his Yak 18 and showed his skills. Yak 18's once regular at airshows are now seldom seen. 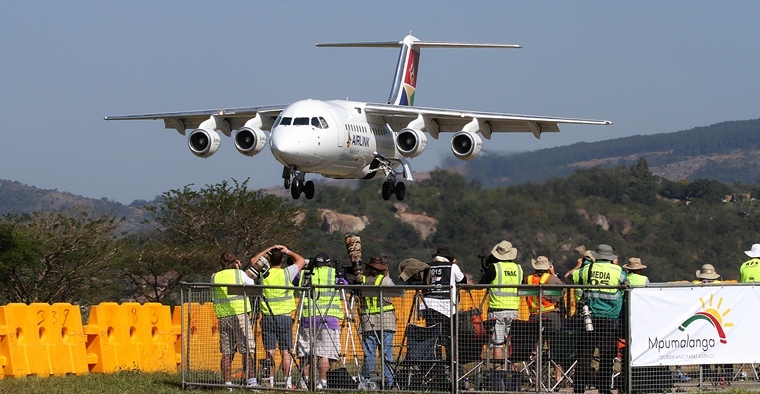 Nelspruit did not lack in jets to thrill the crowd. The first was the Impala MkI expertly flown as always by Mike Weingartz. A more sedate performance by a jet was the flypast by the Airlink CRJ en route from Kruger International. 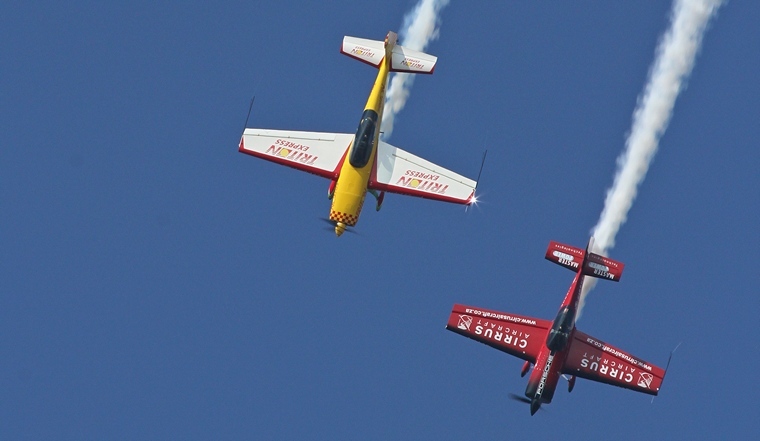 Precision formation flying interspersed with high performance aerobatics in their Pitts Specials are the trade mark of team Torre and on Saturday they again showed why they have been airshow favourites for almost the last three decades. CC Pocock is not only a world renowned bush pilot but also an expert in pyro- techniques. 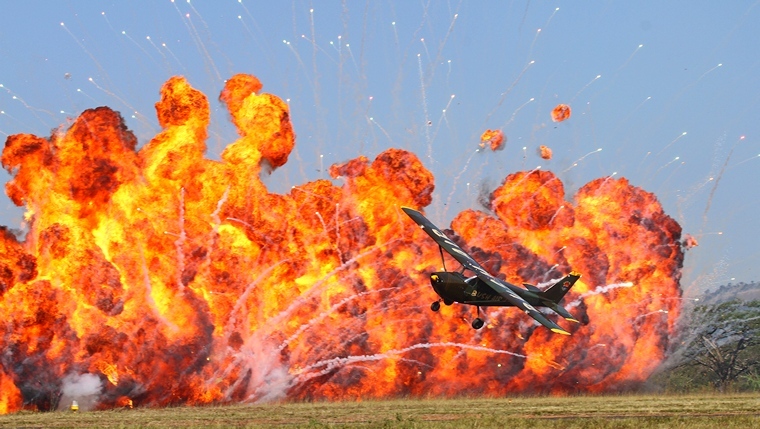 His Wall of Fire at Nelspruit almost equaled the length of the famous show stopper at AirVenture, Oshkosh. 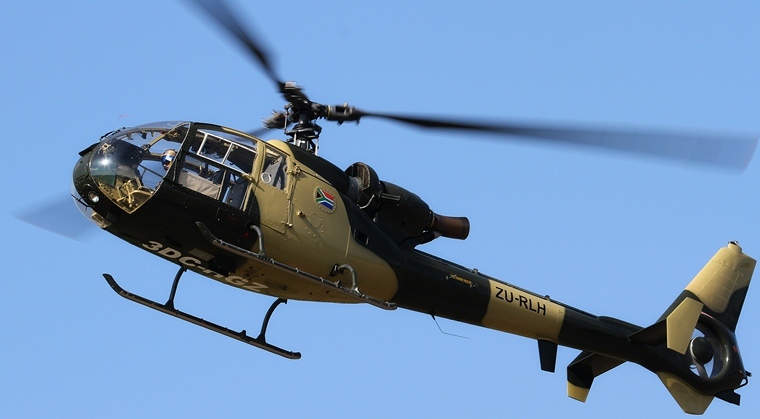 Huyes and water bombers have become synonymous with the heroics of the fire fighters each year battle ever increasing mountain fires in the Cape. 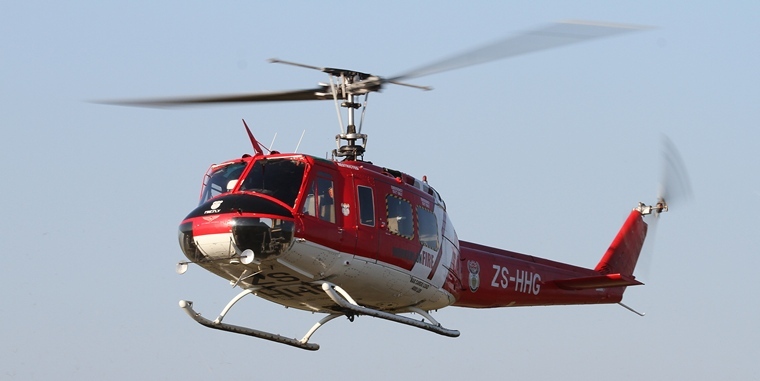 Nelspruit based Kishugu is the biggest fire fighting operation and Africa and fittingly its fleet of helicopters and fixed wings formed a large part of the show with a number of displays during the day. The Silver Falcons on the Friday during validations proofed just why they are the Ambassadors of the SAAF. Thousands of school children were bussed to the field to experience the thrill of aviation and were offered the opportunity to enquire about all the career options in the industry. They enthusiastically cheered each manoeuvre of the Falcons who have varied their display with the addition of a temporary member, the Hawk flown by P.J. Norden. 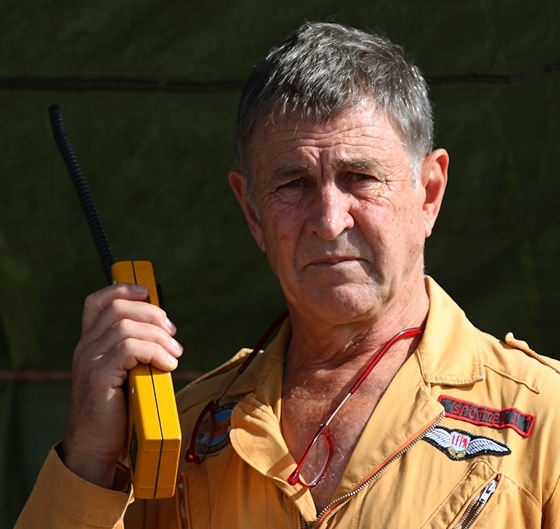 Middleburg resident Richard Lovitt had two of his immaculate ex Easter Block trainers at the show; the L29 flown by Koos Kieck and the L39 flown by Pierre Gouws. 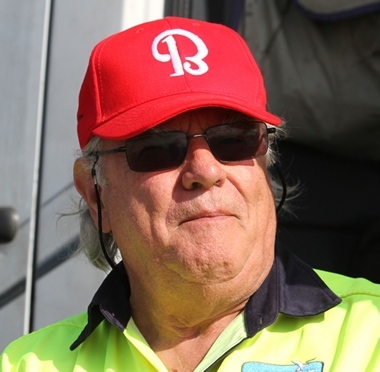 Pierre later on teamed up with Nigel Hopkins in the MX2, a first a at an airwhow in SA. Nigel Hopkins and Larry Beamish besides flying as part of the Rv team Kittyhawks also did a two ship display whilst Nigel who earlier had thrilled the crowd with his solo display then a Porche. 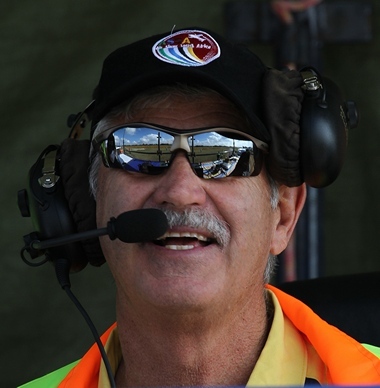 Danie Terblanche who had earlier displayed the Gazelle then took the Husky up for some real crazy flying before taking the little Robinson R22 up for a incredible display in helicopter flying. The day ended with a fireworks and dusk display by the Eqstra Harvards. 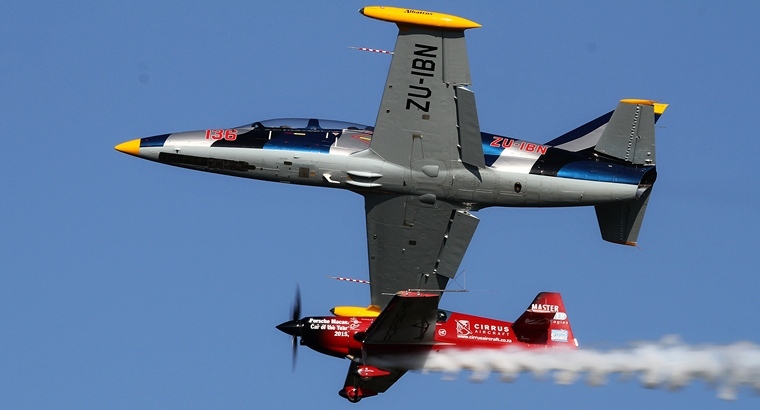 Nelspruit in my humble opinion was one of the best organised airshows I have been too and the number, variety and quality of acts ranks with the best ever!